Refreshed Kia Sportage on sale first-half of 2019. Today at the Chicago auto show Nissan shows off a refresh of what it calls “a critical vehicle” in its U.S. lineup, the Rogue Sport CUV, while Kia unveils a refreshed Sportage CUV. This is the first physical refresh to the Rogue Sport since it debuted two years ago in the U.S. The CUV is slightly smaller than the standard Rogue and is known overseas as the Nissan Qashqai. The ’20 Rogue Sport, on sale this fall, gets a new front fascia – giving the vehicle a “more technical” look and separating it visually from the Rogue, Nissan says. A new V-motion grille, new hood and new DRLs make up the new front fascia. In the rear, new combination lights match the new “more dynamic” front of the CUV. Also for ’20 there are new 19-in. aluminum-alloy wheels, as well as two new metallic paint colors, lime and orange. Nissan makes standard on the Rogue Sport (pictured below) its Safety Shield 360 (automatic emergency braking, blindspot warning, rear-cross-traffic alert) suite of advanced driver-assist safety technologies. For ’19, the Rogue Sport received an updated audio system with Apple CarPlay and Android Auto, an available Bose audio system and revised trim-level equipment and option packages. Nissan also made its ProPilot Assist technology (blending adaptive cruise control and lane-keep assist) available on the ’19 Rogue Sport. 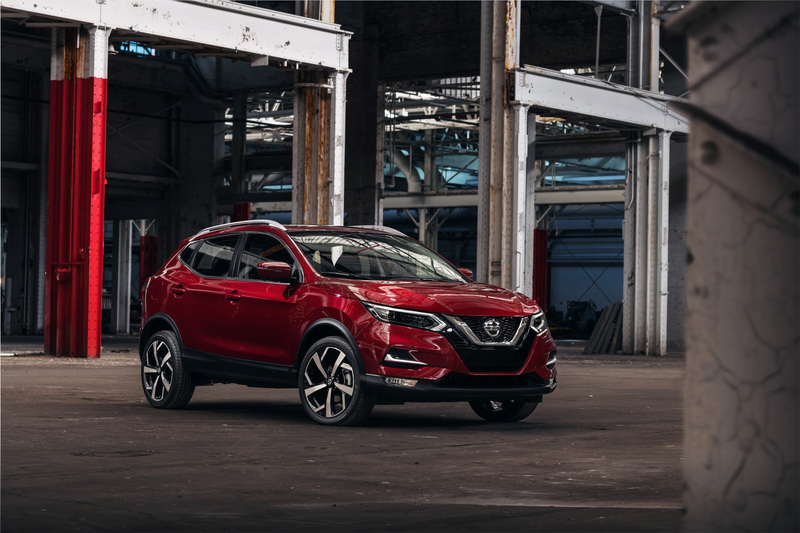 “We’re committed to keeping our crossover/SUV portfolio fresh,” Scott Shirley, vice president-marketing operations for Nissan North America, says in a statement released ahead of the Rogue Sport’s debut today. Nissan also retails in the U.S. the new Kicks small CUV, as well as a refreshed Murano midsize CUV and the 3-row Pathfinder large CUV. It sells one body-on-frame utility vehicle, the Armada large SUV. Meanwhile, Kia stages the debut of its refreshed Sportage CUV, on sale in the first half of the year. For ’20, the Sportage gets even more physical changes than the Rogue Sport, with Kia noting a new front grille, bumper, air intake, skid plate and headlights; updated projector-beam fog lights; available LED headlamps; fog lights and turn indicators. The vehicle also gets new alloy wheels, a redesigned rear bumper and skid plate, new exhaust tip, changed taillight trim and Steel Gray metallic paint. The interior includes SOFINO leatherette seating, new steering wheel and vent bezels, a standard 8-in. (20-cm) touchscreen with Apple CarPlay and Android Auto, as well as available wireless phone charging and navigation. Available ADAS features new for ’20 models include a driver attention warning, LKAS and ACC. There is a new S base trim for ’20, in addition to LX, EX and SX grades. Rogue Sport sales rose 138.6% last year from 2017, to 89,452 deliveries, Wards Intelligence data shows, while Sportage sales rose 13.7% to 82,823. Both models live in Wards Small CUV segment, whose sales jumped 32.1% last year to 1.3 million units.